A talk given by A. Ortiz-Bernardin at the 1st Pan-American Congress on Computational Mechanics, April 27 – 29, 20145, Buenos Aires, Argentina. One Shields Avenue, Davis, CA 95616, U.S.A.
Over the past two decades, meshfree methods (MMs) as a numerical tool for solving PDEs have been well-developed. In contrast to finite elements, MMs do not require a mesh to construct the basis functions, which are smooth and non-polynomial functions. This feature makes MMs more appealing for the discretization of field variables in problems where, for instance, higher-order smoothness is needed or mesh distortions introduce a limitation for standard finite elements. Nonetheless, Galerkin MMs require background cells to perform the numerical integration of the weak form integrals. Usually, Gauss integration is employed on a background mesh of finite elements. This introduces integration errors that affect the accuracy, convergence and stability of the method. Several authors have tried to overcome the integration issue resulting in integration schemes that only ensure consistency and substantially improve accuracy, but stability is not guaranteed. In this work, a new approach for Galerkin MMs is introduced, which draws on the recently proposed Virtual Element Method , to ensure both consistency and stability of the approximate bilinear form. 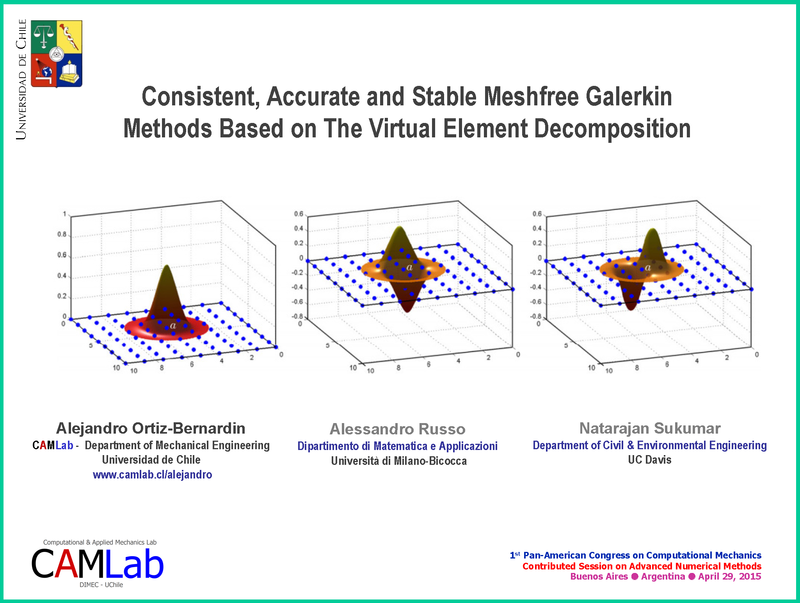 Benchmark examples in two- and three-dimensions will be presented to demonstrate the accuracy, consistency and stability of the method for Poisson and linear elasticity boundary-value problems.